I read this article and found it very interesting, thought it might be something for you. The article is called 5-Year Study Shows Salaries Rise But Spending On Arms Slow Down and is located at https://archive.indiaspend.com/sectors/5-year-study-shows-salaries-rise-but-spending-on-arms-slow-down-34194. An ongoing war of words between Chief of Army Staff V.K. Singh and the Indian Government highlighted the deficiencies in the fighting capabilities, especially in arms and armaments. IndiaSpend’s Sourjya Bhowmick has been studying various heads in the army’s balance sheets over the last five years, including manpower. A key take away from this round is that the pace of spends on salaries and pensions far outstrips that on arms, ammunition and modernisation. Moreover, the forces generally are unable to spend even what’s allocated for arms, ammunition and modernisation. Salaries and wages have almost doubled in 4 years while the spends on arms and modernisation have only risen at best one and a half times in the same period (see tables). While there are the much discussed delays in procurement, which in turn could result in less actual spend, other expenditure heads don’t face such hurdles. It’s been argued, for instance, by defence experts that India’s army needs to trim its manpower while possibly spending even more. And yet, as we pointed out in an earlier report – despite a Budget of Rs 45,027 crore as pay and allowances, the Army is still showing a manpower shortage of 11,456 – as of December 2010. If we include the Navy and the Air Force, the total shortage comes to 13,704. Here’s the terminology. Capital Expenditure or capital outlay typically goes towards modernisation of the forces. The five most important components of this expenditure (army) are generally budgeted for land, constructions, aircraft & aero-engine, heavy & medium vehicles and other equipments. There are other entities like the research & development (R&D), National Cadet Corps and other military production elements. These factors have not been included in our study of the Capital outlay break up. Army and Air Force constitute the majority when it comes to share of modernisation expenditure. One simple reason is the size and importance of these two. 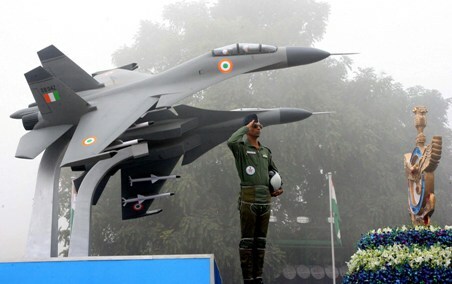 Reports of the Finance Commission and the Budgets (among others) project the approximate share in capital outlay at 53% for the Army, 16% for the Navy and 31% for the Air Force. However, the Army and Air Force’s revenue estimates are always lower than the budget estimates while for the Navy, it’s the other way round. One reason can be that Army and Air Force are budgeting ahead while Navy seems to be lagging. Though under spending can be another reason for the revised estimates of the Army and Air Force every year. From the year 2002-2003 till 2010-2011 there has been continuous ‘under spending’ under the Capital Expenditure head, to the extent of Rs 31,135 crore. The highest was in 2003 when 30% of available funds were not spent. In 2010 under spending was around 15%. Only in 2005-2006 was there optimum utilisation. On the other hand from 2007-2008 to 2009-2010 there was over spending of revenue expenditure. In 2008-2009, 30% was over spent, one reason being the implementation of the Pay Commission recommendations which saw a big hike in all Government salaries. The Defence Budget faces a challenge with under spending on capital outlays. This is despite India being the biggest importer of arms and equipments in the world. And yet, the spotlight on the delays in procurement and alleged irregularities could delay decisions even further. We will study the procurement deals and the utilisation of capital outlay more carefully in due course. On the other hand we also see that revenue expenditure with pays and allowances constituting majority of it is over utilised, forms the major chunk of defence expenditure but still there are shortages in all the three services. From the table above we can see that the wage of our defence services is increasing every year barring the year 2010-2011, where the pay and allowances decreased in all the services. A possible reason for this decrease could be the Sixth Central Pay Commission. The implementation of the Pay Commission may have resulted in the payment of arrears in 2009-10, resulting in a major hike of 77 percent. However, the Budget would have decreased in 2010-11 since the arrears didn’t have to be paid this time, just the revised salaries. Capital Expenditure is essentially meant for modernisation of our defence services, acquisition of machinery and to some the root of all scams existing in the defence. Let us divide the Capital of all the three services for the last few years.